So it's been quite some time since I've gotten an Influenster VoxBox. I was super excited to be chosen to review the TLC VoxBox - geared specifically to moms! This box is full of what I would consider to be some pretty awesome things - I thought I'd share a little bit about my box and what I think of the different items inside! First off, here is the box - cute little purple box full of goodies! 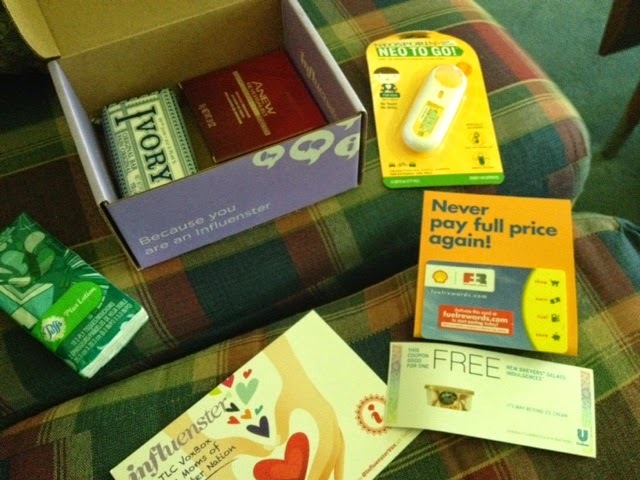 All of these goodies were provided by Influenster for testing purposes. There are quite a few things here! 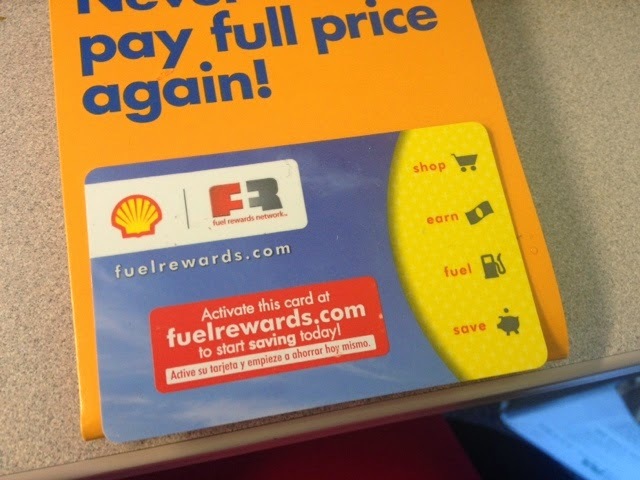 The first item is a Shell Fuel Rewards card. It is a loyalty program that you can use at Shell gas stations to save money on gas. This is awesome for a mom like me who is always on the go, especially in the summer - and I find my new car goes through gas a lot faster than my old one, so saving money is a great thing! The downside? We have Shell stations in MN, but none of them are terribly close to my house. I am still going to activate the card, if I'm out and about and need to fill up and I can find a Shell station, I will definitely use this! The next thing I'm super excited about - how could you not be excited about free gelato?? 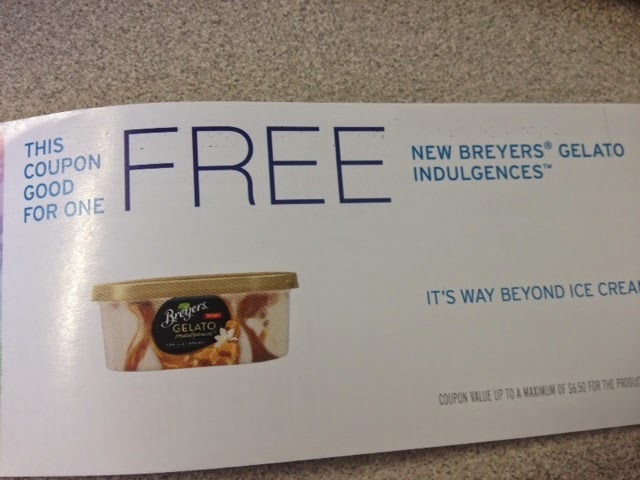 I've been wanting to try the Breyers gelato, but I have also been trying to keep less sweets in the house - but seeing as I can get one of these FOR FREE - I plan on stopping for some on the way home tonight. I will report back as to what I think! Ok, so Oliver isn't terribly mobile yet so he's not likely to injure himself - hopefully anyway - but this next item looks really cool to me. 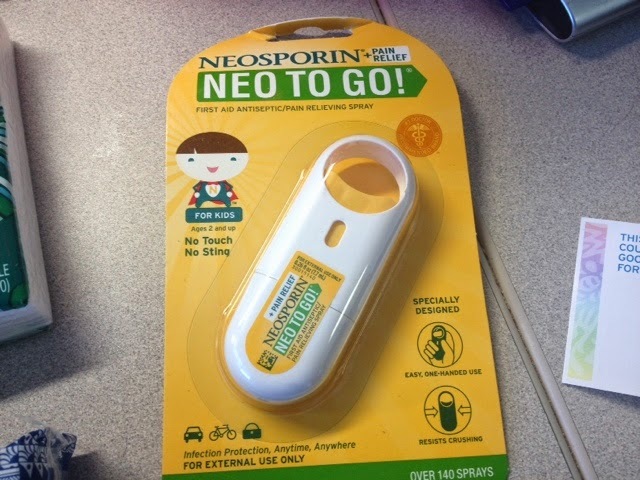 Neosporin To Go in a handy little bottle! The best part about this? You spray it on! You don't have to squeeze anything out of a tube or touch the cut/burn/bug bite. I could see this being useful for adults too, not just kids! I love that it will fit in the diaper bag or my purse or even a pocket. 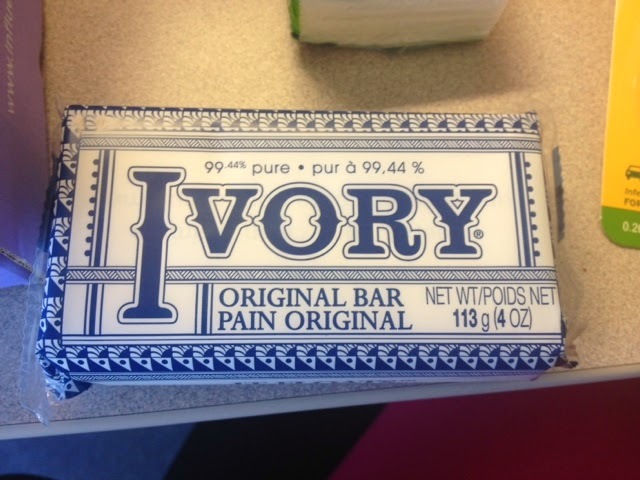 I grew up using Ivory soap - because I think my mom grew up using Ivory soap - but I haven't used it in a number of years now. The cool thing about Ivory is it is free of dyes and perfumes, so it's great for delicate skin on babies or even sensitive skin on mom! And also? It floats! So if you drop it in the bathwater, you don't have to dig at the bottom of your tub for it, it floats in the top of the water! 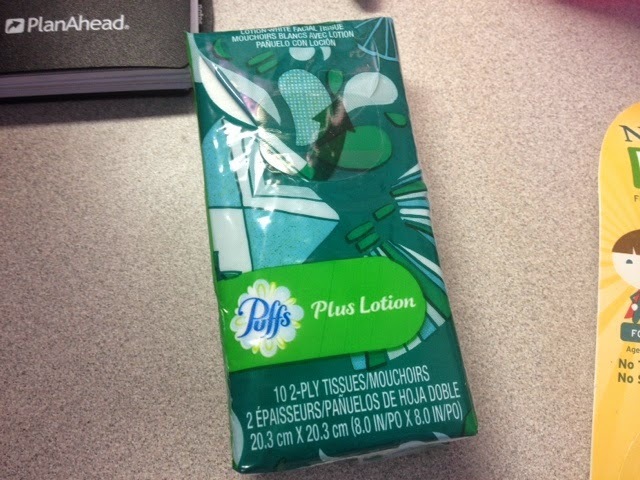 What mom doesn't need tissues in her purse? I don't care if it's cold season or allergy season or you're going to a sad movie or whatever - tissues are a necessity! These Puffs also have added lotion, so they might not be great for dabbing at sad eyes - but they'll feel great on a chapped nose that's tired of being blown from running (seriously is pollen season over yet?). These will be quite useful! 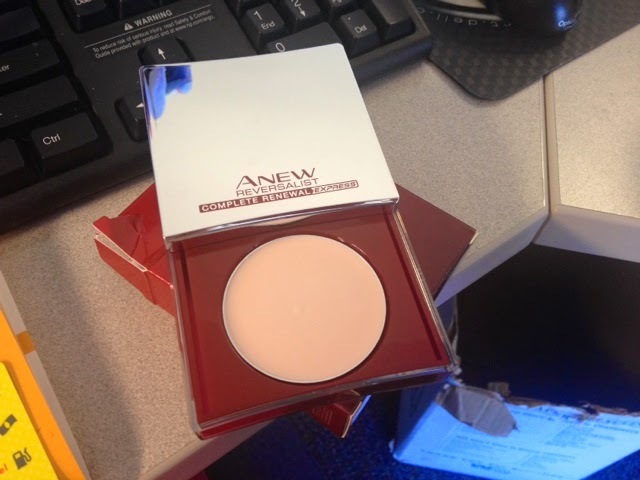 And finally we have this Anew Reversalist Express Wrinkle Smoother from Avon. While I would like to stay in denial that I'm getting older - the truth is I'm getting older. I don't feel I have super wrinkled skin yet, but this stuff promises to smooth out forehead wrinkles, crows feet, etc. Basically, it will smooth out your skin for a nice line free look. Again, I haven't tried it out yet, but I will, I figure it has to help with some of my skin imperfections, be it from age or just uneven skin! It seems pretty simple to use, just pat it on after your moisturizer. So there you have it! These are all very useful items for a busy mom like me! I can't wait to try them all out - especially the gelato, yum! Thank you Influenster! Looks like a great box with lots of cool goodies! I can't wait to hear what you think about the gelato! Wow! Look at all of that swag! I love the neo-to-go! Those look like lots of fun goodies! Especially the spray Neosporin--I'd definitely use that! Ooh I bet that gelato will be delicious!